After leaving school, Elizabeth took a Foundation Course in Art and Design at Manchester Polytechnic. She then did her degree in Fine Art at the University of Newcastle upon Tyne, where she won both the John Christie Prize for Painting and the Oliver Hicks Memorial Prize. 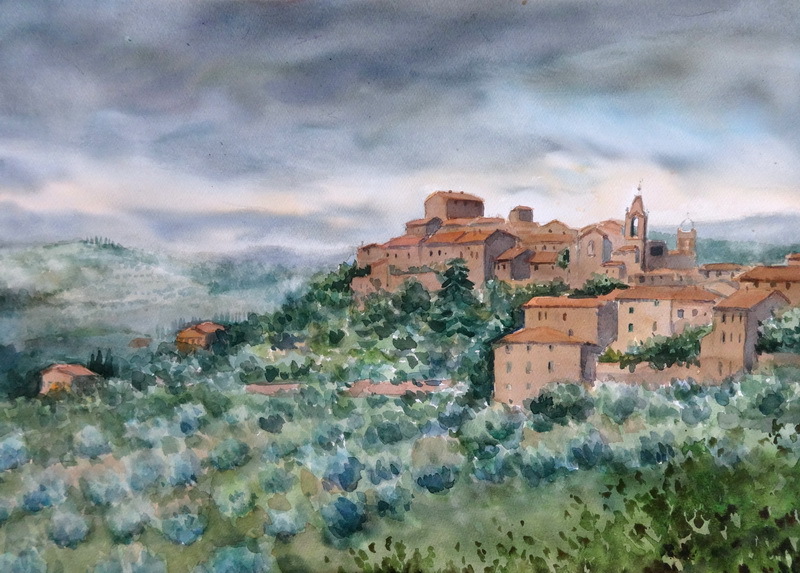 Elizabeth has always loved painting landscapes and in 1995, she visited Tuscany to steep herself in its rich artistic history and paint the region’s extraordinary countryside. Whilst there, she organised her first classes and workshops in the village of Pergo, near Cortona. In 1997, Elizabeth decided to permanently settle in Tuscany and she has been painting and exhibiting in the region ever since. She now lives in Montisi, part of the Comune of Montalcino in the Siena area, where she has a studio that you can visit in the town centre. Tuscany is a land of contrasts, with its rolling hills and olive groves, hilltop towns and medieval cities. Elizabeth finds the combination of its lights and rhythms an ideal inspiration for her work. Please visit Elizabeth’s online Gallery to view a selection of Elizabeth’s work, including the latest available paintings for sale.